Proceedings of the Sixth Vertebrate Pest Conference, (VPC-1974). Published at the University of California, Davis, Published 1974. 299 pp. 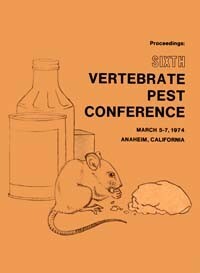 Proceedings of the 6th Vertebrate Pest Conference March 5-7, 1974 Anaheim, CA, arranged by the Vertebrate Pest Conference. Editor Warren V. Johnson and Assistant Editor Rex E. Marsh. Description: Urbanized Wildlife, The European Rabbit Problem in New Zealand and Feral Hogs -- Boon or Burdan.